Coontails are one of the most unique hairstyle that is created by hairstylist. 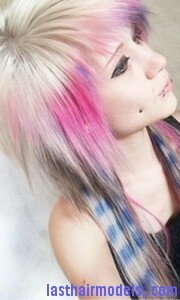 But this style can be achieved even at home by following a proper styling method and styling tools. 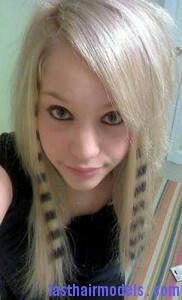 In this hairstyle, the hair will have horizontal, two-tone stripes similar to a raccoon tail. Here is a simple process that can be followed to create a coontail hairstyle by using peroxide. First mix the bleaching solution in a plastic bowl as per the kit instructions and then divide the section of hair that will be used to create the coontail. Try to tie the section at the base of your scalp using a hair tie and secure rest of the hair at the back of your head. Wear a shower cap on your head and create small hole in the cap on the section of your hair that will be sued for bleaching. Pull the section of hair through the hole and now remove the hair tie. Keep the roots of the section exposed and start applying the bleach solution over the section of hair starting from root to tip as per the kit instructions. Now wash your hair and dry it as usual. 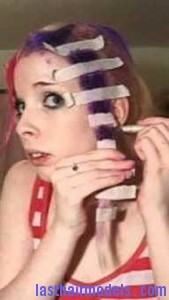 Pull your hair section taut to wrap the strips of tape horizontally all the way around forming bands. 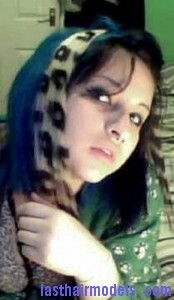 Mix a black hair color and apply it over the un-taped portions of the hair using a paintbrush. 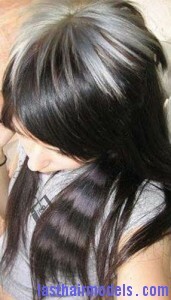 Leave the color on your hair as per the package instructions and carefully rinse it out.